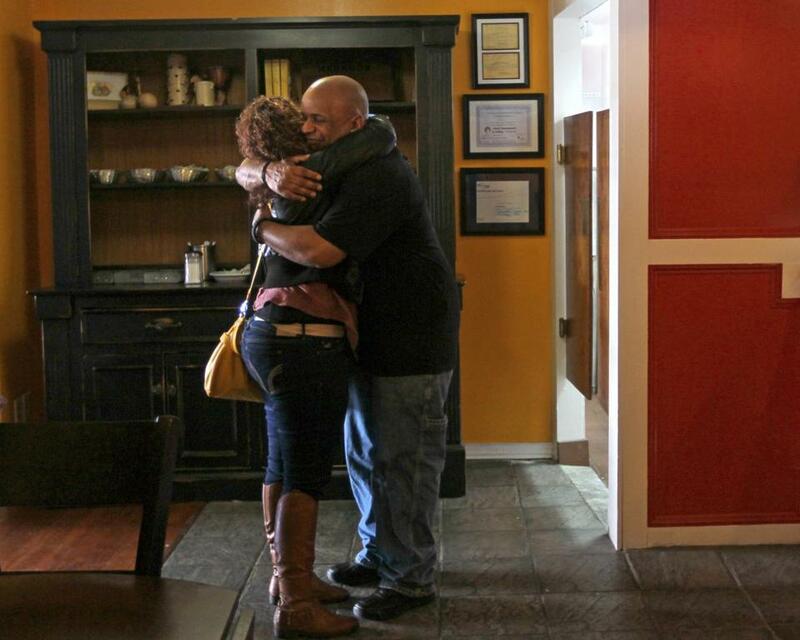 Ivette Amparo of Worcester greeted Reyman Ortiz, a waiter at Cafe Reyes, a Cuban restaurant that opened on Jan. 19 in Worcester that employs former addicts in order to help them gain vocational skills. WORCESTER — Reyman Ortiz has been in and out of prison for much of his adult life and addicted for 25 years to heroin, cocaine, or alcohol. The 40-year-old father of seven has been clean for only six months. But inside colorful, cozy Cafe Reyes, the bad days have been pushed aside, if not forgotten. Ortiz is taking orders with a smile as he waits on tables, hustles in and out of the kitchen, and apologizes when he forgets to box a customer’s uneaten empanada. Ortiz had never done this work before. But in earning the unprincely sum of $100 a week plus tips, he’s a beaming, bustling bundle of nonstop energy in one of the latest additions to this city’s Restaurant Row. Amid the drumbeat of tragedy that is the epidemic of opioid abuse, Ortiz and his co-workers at Cafe Reyes are a burst of light. They include former addicts, most of them have been to prison, and many have been homeless. But through a new work program at this Cuban restaurant, they are being exposed to what the cafe’s managers call the “soft skills” of life: showing up on time, making a sandwich, engaging strangers in conversation. Ortiz and other staff at Cafe Reyes live at the affiliated Hector Reyes House, the only residential treatment center in Central Massachusetts for Hispanic men struggling with substance abuse. The cafe, which opened Jan. 19, is the brainchild of Dr. Matilde Castiel, the executive director of the Hector Reyes House, who believed she had a recipe for success. The staff share an affinity for Latin food, language is less of a barrier at the cafe, and peer support is an arm’s length away. That sense of life is as much a part of Cafe Reyes as Cuban sandwiches and black bean soup. Latin music provides a pulsing, upbeat ambience; the walls are awash in vibrant color; and quiet chatter fills the 42-seat dining room. But more important, for Castiel’s purposes, is that the smiles on the weathered faces of hardened men exude a sense of life renewed. “We’ve been so antisocial all our lives,” said Jesus Rivera, a 40-year-old former heroin addict and inmate. As an example, he nodded toward Echevarria as his co-worker scurried back and forth. A staff of seven men is rotated through the cafe from the Hector Reyes House, a state-funded facility where they typically spend six months to a year of recovery. The small payments they receive for working at the cafe are meant as a stipend. If all goes well, they might be hired by the cafe or use the skills learned there to find another job. 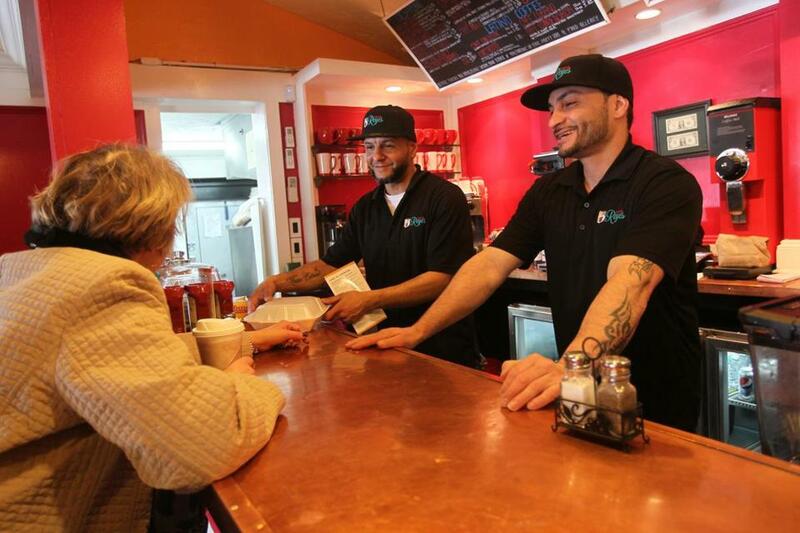 Jesus Rivera (center) and Carlos Echevarria waited on Phyllis DiFronzo of Worcester at Cafe Reyes earlier this month. Only 40 percent of the men who leave Reyes House successfully embark on clean, crime-free, productive lives, Castiel said. The others succumb to drugs or fail in other ways. “It’s disheartening,” Castiel said. The walls of Reyes House hold pictures of its graduates. A half-dozen of them are dead. Kenny Bourbeau, the cafe’s chef and general manager, knows firsthand the peril that his staff faces. A close friend of Bourbeau’s died of a heroin overdose in 2008. The veteran chef was recruited to run the cafe and oversee the steep learning curve of his novices. Some of them had never made coffee. Others had never used a calculator. That solution comes with a sink-or-swim approach that throws staff into unfamiliar roles, Bourbeau said. But unlike much of the working world outside the Shrewsbury Street cafe, the chef runs the business with a pinch of leniency. “If they’re not on time or there’s a little attitude, we’ll talk about it afterward,” Bourbeau said. At least at first. During one recent lunch, Sherry Tupper, who lives in West Boylston, stopped by and left impressed. “Our waiter has a sense of pride in what he’s doing, and it showed,” said Tupper.